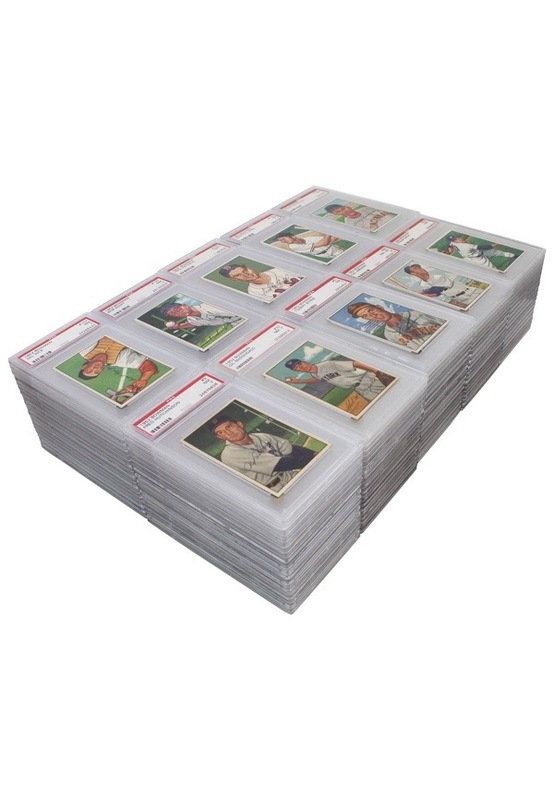 The 1952 Bowman set consists of 252 cards, each measuring 2-1/8" by 3-1/8”. Each card front shares similarities with the 1951 Bowman entry, with a color art reproduction of a player photograph and facsimile autograph on the front. The set is anchored by the cards of 1950s National Pastime heroes Mickey Mantle and Willie Mays, as well as fellow Hall of Famers Yogi Berra, Roy Campanella, Leo Durocher, Stan Musial, Pee Wee Reese, Robin Roberts, Warren Spahn and Casey Stengel. Offered is a near complete set (181) of the 1952 Bowman set. All cards have been encapsulated and graded by PSA. Almost all of the cards have been graded a NM 7 while some are graded a NM-MT 8 and NM-MT 8 (OC).